It is remarkable that Pakistan's brand value has increased by double digits and the country still ranks smack in the middle of the 100 nations ranked in spite of a concerted western and Indian media campaign to destroy its image. The brand value of a country is an attempt to quantify its national image in the global marketplace. It encourages inward investment, adds value to exports, and attracts foreign tourists, according to the report. Pakistan ranks ahead of 49 countries including Hungary, Slovakia, Egypt, Luxembourg, Bulgaria, Croatia, Serbia, Lithuania, Latvia, Estonia, Iceland and Cyprus. Among South Asian nations, Pakistan (51) ranks behind India (9) and Bangladesh (39) but ahead of Sri Lanka (61) and Myanmar (73). The United States tops the list with a brand value of nearly $26 trillion followed by China in second place with a brand value of nearly $13 trillion. Germany ranks 3rd, United Kingdom 4th, Japan 5th, France 6th, Canada 7th, Italy 8th, India 9th and South Korea 10th round off the top 10. Pakistan's brand value has jumped 15% to $196 billion in 2018, up from $171 billion in 2017, according to Brand Finance's Nations Brands Report 2018. The report ranks Pakistan at 51 among 100 nations ranked. It gives Pakistan an A brand rating on a scale from AAA+ to CCC-. 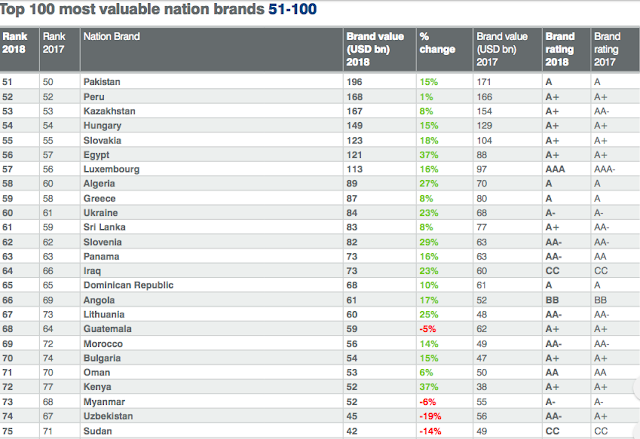 It is remarkable that Pakistan's brand value has increased by double digits and the country still ranks smack in the middle of the 100 nations ranked in spite of a concerted western and Indian media campaign to destroy its image. Let's put things in perspective. Pakistan (51) ranks behind India (9) and Bangladesh (39). The Brand value($) of Pakistan is 196 billion up 25 billion which is lowest among the big three in South Asia. Much behind that of Bangladesh 257 billion up 49 billion and way behind that of India 2159 billion which is up 113 billion. I would argue that is very poor showing as far as Pakistan is concerned! Asharful: "I would argue that is very poor showing as far as Pakistan is concerned! " And I would argue that it's great showing by a country which is the target of an unrelenting western and Indian media campaign of demonization and slander for decades now. "And I would argue that it's great showing by a country which is the target of an unrelenting western and Indian media campaign of demonization and slander for decades now". Indian media hardly mentions Pakistan these days... also Indian media is for India's internal consumption- purely. Non-Indians (except Pakistanis, it seems) do not follow Indian media at all. Sir, you may want to look at the 2018 Multi-Dimensional Poverty Index that just came out. Pakistan now ranks behind all countries in South Asia in spite of a lower % < $1.90/day. Chandrakant: "Pakistan now ranks behind all countries in South Asia in spite of a lower % < $1.90/day." The MPI report 2018 uses data from earlier years (2012/13) for Pakistan than for Bangladesh (2014) and India (2015/16). 2016 UNDP survey showed Pakistan’s MPI poverty rate declined from 55% to 39% from 2004 to 2015. Sir, sorry but I wanted to highlight and make aware the changes from 2010 MPI report which similarly used data from earlier years. In the 2010 MPI report (#1 being the most deprived) Pakistan was at 36 position ahead of India(30), Bangladesh(27) and Nepal(20). In 2018 only Pakistan became more multidimensionally poor and moved to 35 behind Bangladesh(38), Nepal(48) and India(53). I hope IK will address issues and help people of Pakistan less MPI poor because ignoring it will be devastating.